Mendoza, Argentina evokes an image of a quaint village surrounded by endless vineyards with wineries that produce the best Malbec in the world. 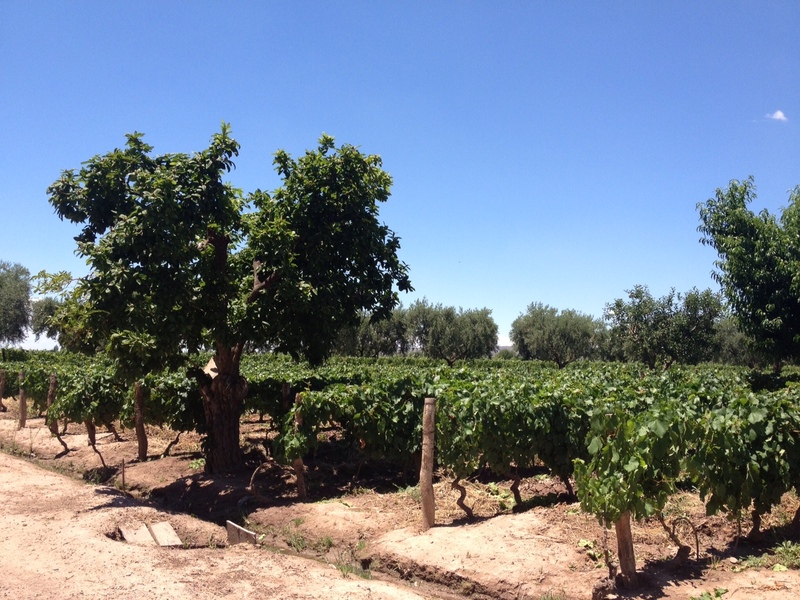 The Malbec part was accurate, but Mendoza is a booming mid-size metropolis, with a large commercial section and a metro population of about a million people. Although not quite the village I visualized, Mendoza keeps the small town feel with wide tree covered avenues and many plazas to pass the time. The entire city shuts down during its daily siesta from 1-5PM (we should adopt best practices and adopt naptime in the US). Hostels normally fall into three categories: the party until you pass out type, the awkwardly silent ghost-town type, and our favorite – the welcoming, relaxed, meet other backpackers type. Hostel Mora Mendoza fits definitely in the third category. We quickly made friends with others staying in the hostel. Among them, we met Anna on vacation from Germany, and Shannon, Andy and Dylan from Oz. And it was Dylan’s birthday! Wine + bikes + new friends sounded like a perfect way to spend a day – our group was set. A 45-minute public bus ride took us to Lujan de Cuyo. The bike rental shop gave us a recommended route to follow – 3 wineries and 1 liquor/chocolate shop. Lagarde’s sommelier was excellent in explaining the flavors and even let us experiment identifying flavors in a wine aroma kit. I regret to say that after this point, I have no recollection of the names of the other stops we made. The attempts to recall the names from Google are futile. 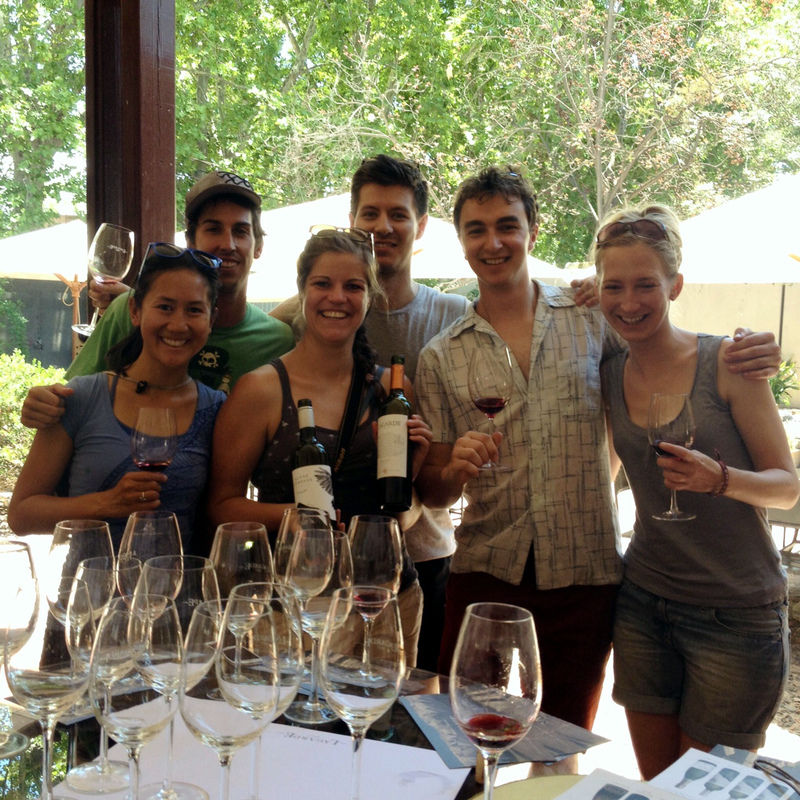 But we did dine on delicious Argentinian steaks and grilled vegetables for lunch paired with another wine tasting. The final stop specialized in savory/sweet jellies, liqueurs – including absinthe, and chocolate (Were I to do this again, I would totally skip this stop since sweet drinks aren’t my thing and Argentina’s chocolate is not anywhere near on par with their wine). Bottles of wine over the next few days later, it was time to head to Buenos Aires, our last stop in South America! 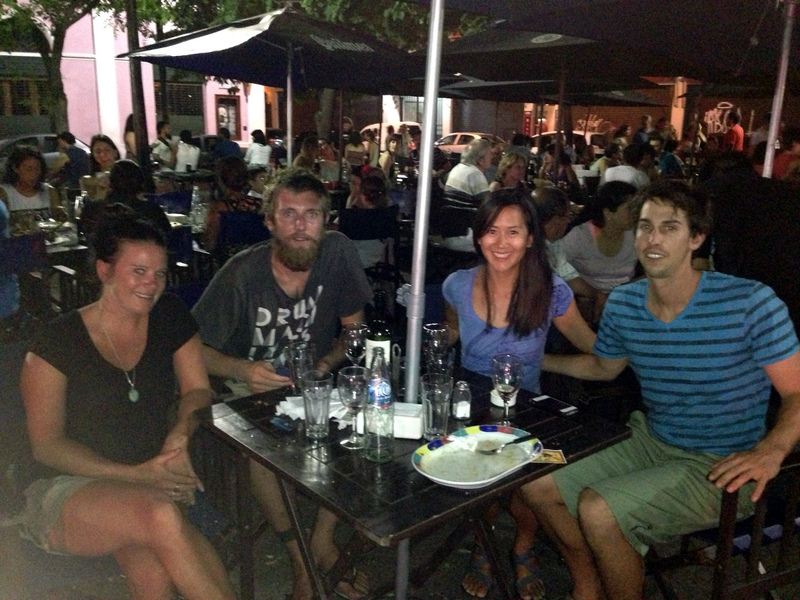 The first night in Buenos Aires, we were so lucky to meet up with Luciano, a friend from university. He met us after work in front of Casa Rosada and guided us down his favorite street, Avenida de Mayo. We caught up over beers in Café Tortoni, Argentina’s oldest café. Prior to coming to Argentina, everybody advised us to bring crisp USD to take advantage of the Dolar Blue (long story short, much better exchange rate vs. the official rate e.g.ATMs or credit card). Luciano was nice enough to provide insight and give a local’s perspective on the the events leading up and to the current market situation as well as the effect it has on the people of Argentina. Hearing these perspectives are so much more powerful than reading a snippet on the news. 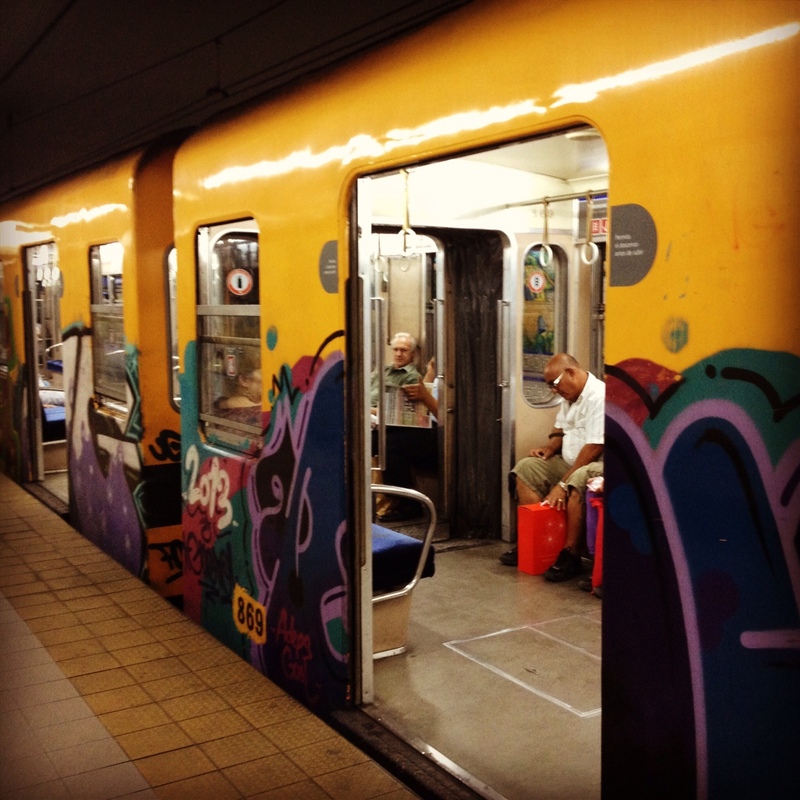 Buenos Aires forces its visitors to relax and take things slow. Finding a quick bite is almost an impossible task, as most places are sit-down restaurants where most of the patrons sit outside and enjoy the view with a cup a coffee. 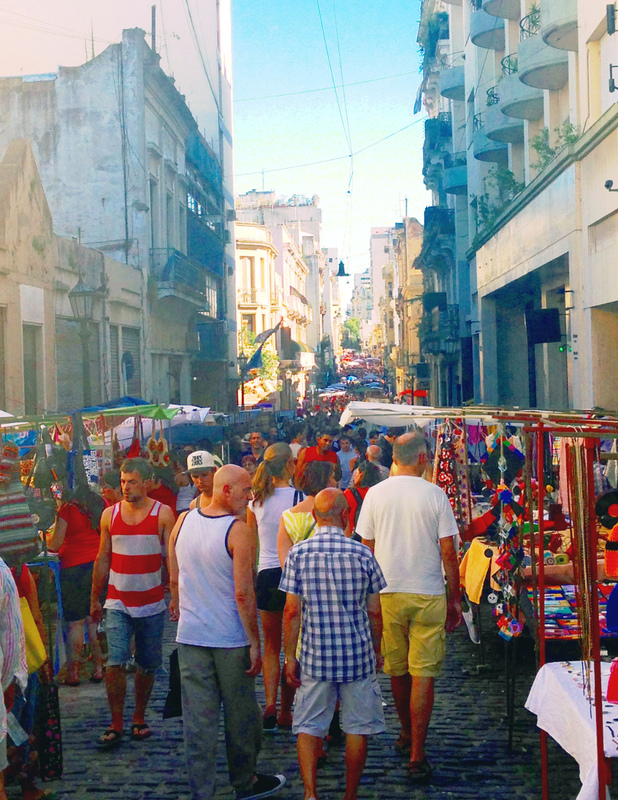 Romantic San Telmo was our home base, and from there we explored different neighborhoods by foot. 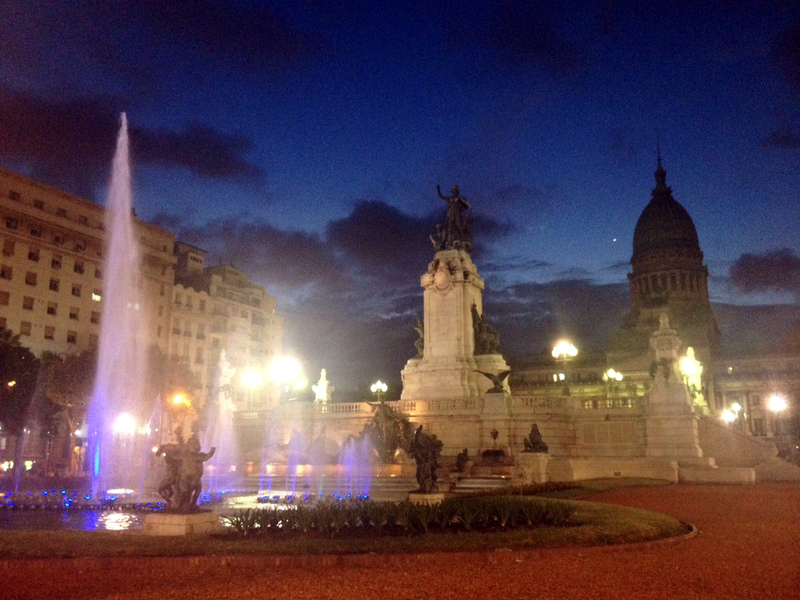 Buenos Aires was easily my favorite major city on our trip. 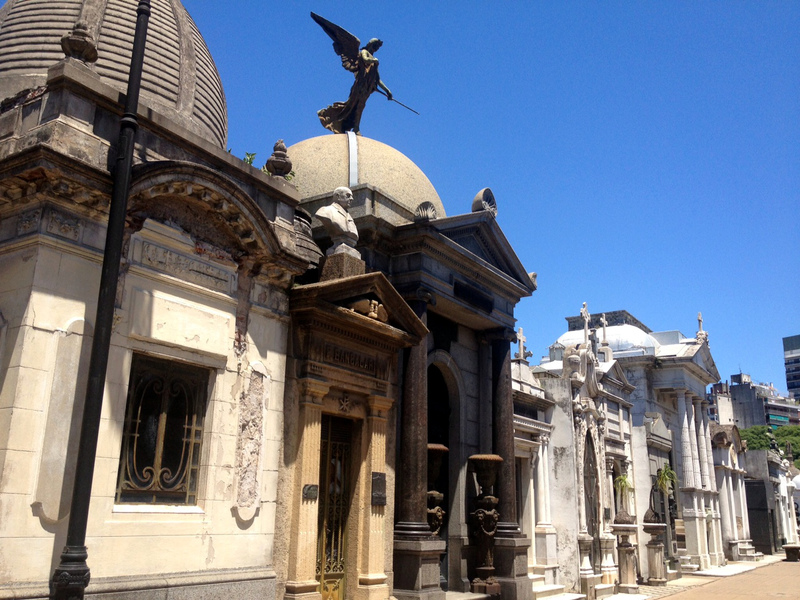 The luxuries of perusing San Telmo’s extensive Saturday market, exploring each avenue of the Parisian-styled La Recoleta and its famous cemetery, enjoying a free show at the Teatro Colón, picnicking in one of the many parks (Parque Centenario was one of my favorites). It was our luck that Tash and Nick were in town as well – it was our third time to meet up with them (1. Lobitos, Peru and 2. Salar de Uyuni, Bolivia). We wined and dined al fresco in Plaza Dorrego and enjoyed an exceptional Jimi Hendrix cover band. While traveling, it is always nice to see some of the same people throughout the journey, as new friends become familiar faces. We splurged on our last night in South America and stayed at the Sheraton, the land of lounges and welcome baskets! And there was a pool! After 4 months backpacking, having a pool was too good not to share. We invited the Aussies we had met in Mendoza and as luck would have it, my friend from middle school, Ann, and her boyfriend were in town on a spontaneous trip. Such a perfect way to end the trip! I was constantly in awe of the beauty of the scenery and culture and humbled by the generosity in their time and hospitality we received. Ciao for now, South America. Gracias por los recuerdos increíbles. Voy a extrañarte.